A tool to kick devices off of your network and enjoy all the bandwidth for yourself. It allows you to select specific or all devices and ARP spoofs them off your local area network. Compatible with Python 2.6 & 2.7. 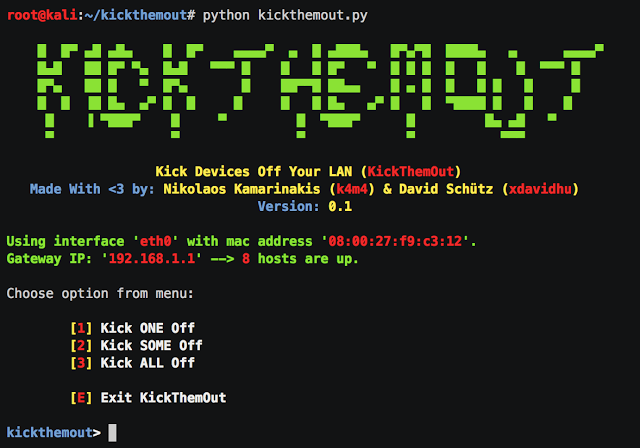 KickThemOut is provided as is under the MIT Licence (as stated below). It is built for educational purposes only. If you choose to use it otherwise, the developers will not be held responsible. In brief, do not use it with evil intent.